We open on a young man on a quest. He is the prince of his land and his father has just died. To claim his kingship, he must travel to the grey land, defeat a dragon, and bring back a damsel for his bride. This is how things have always been in Harding. The farther dies and to claim his place, the son must complete this rite. Tradition in Harding decrees that the prince can be give no help to defeat his dragon, not even in the form of advice. But the prince picks up tidbits through gossip and prepares as best he knows how, practicing hunting, arms, and the type of conquests that involve a (reluctant) maidservant and a deserted hayloft. His mother (once a damsel herself) sends for him each day, to hear of his achievements and praise him. He omits any hayloft adventures, though he thinks she must know and approve of his manly pursuits. The day the prince’s father dies, his mother sends for him once more. She breaks with tradition, telling him he has two weapons to fight the dragon (his mind and his sword) but that to win the day, he will need a third. We see the prince enter the dragon’s castle, using cunning and steel to bring the dragon low, as he frantically thinks what his third weapon could be. We open again on a young man, his quest now finished. The naked damsel lies in his arms, no memories of her past in her head. “I rescued you,” the prince tells her. He defeated the dragon and carried her down the cliff to bring her home as his bride. He gives her clothes and food and a name (Ama, because women’s names should start with a soft sound, he says); he is handsome and strong, this must be her destiny. Ama enters the prince’s castle and begins to learn what her role will be. She is to be beautiful and compliant, silent and submissive, eager to please her king. She should seek the king permission to walk in the garden, she shouldn’t admit she knows she’s beautiful, she should ready herself for her wedding night. Women are vessels, the king tells her, to be filled by men. It is her duty to listen, he says, and his to speak. She must wait, he will take action; she admires, he creates. Distressed at this picture of her future, Ama seeks council and kindness from those around her. “Wild creatures must be broken so they can be tamed,” the falconer, the king’s best friend, tells her. “You’d better pretend to enjoy it, because the king will be angry if you don’t,” the reluctant maidservant tells her. Damsel is a familiar story in many ways. The handsome prince rescues the damsel in distress and is rewarded with her heart. Tale old as time. So is the other story being told. That of young women penned in by the rules and expectations forced on us, constantly told what we should and shouldn’t do, what we can and cannot be. Told that it is our job to fulfill men, how to make men feel smart and wanted and strong, we must make ourselves soft and gentle and weak. It’s a story women know deep in our bones. But do we know how that story will end? We open on a young man on a quest. How will we close? Share the post "You expect me to jump up on board with you and ride off into your delusional sunset"
Amanda enjoys stories about teams who work well together, witty banter, and characters who need hugs very, very badly. How can I keep leading when the people I’m / Leading keep retreating? Welp, this is going on my TBR list! And this review is beautifully written! This looks great, thanks for such a great review! This looks great and there seems to be a lot of interest for it – there are already 10 holds for the one copy available for my library! I just went to my library and they don’t have it. I told them to remedy that ASAP. I was really surprised that no other Cannonballer had reviewed it yet, it seems very much up our alley! I’m sure we’ll be seeing a number of them after your excellent review! I had never heard of it before though, so I wonder if it was just flying under most folks’ radars. 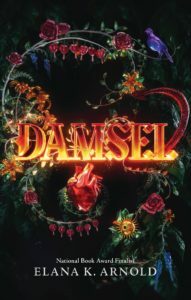 It looks like the Kindle version of Damsel is on sale at Amazon for $1.99. I just picked it up rather than continue waiting for a library copy. This got a Printz honor this year, which I think is rare for a fantasy book. Very excited for it! I’m not surprised, it’s one of the best books I’ve read in a long time! Your review literally made me go DAMN out loud. Well done! Okay! I quit. Can’t top this review!!! Ah, my blushes, spare them! Thank you!